One of the many reasons I travel is to learn, explore, seek, find and discover. And usually when I’m going about my business getting to know people from far off lands, my mind becomes that much broader. My perceptions of what I imagined people to eat, dance to and enjoy begin to change as I’m enlightened about their language, lifestyle and social interaction. But the most surprising discovery of all whilst travelling is how little people know about Africa and my home country South Africa. My husband with the South African flag. I will be honest and say that I haven’t travelled to any other African country other than my own, something I deeply desire to rectify soon. But upon teaching English in Seoul, South Korea, I was disturbed to find out what children and people associated with Africa. 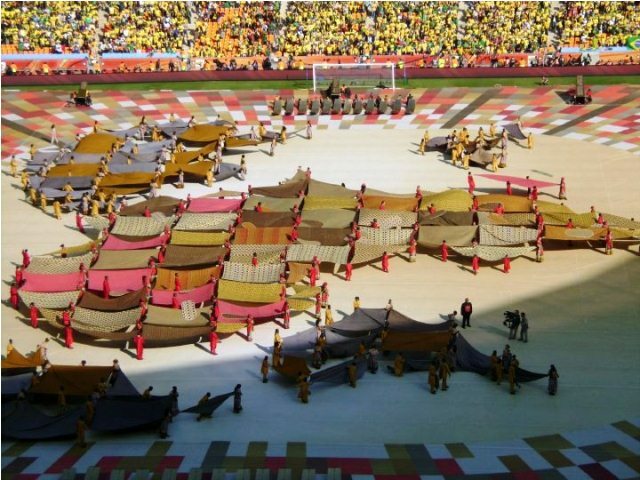 Performers making the shape of Africa at the Soccer World Cup 2010 held in South Africa. Whenever I uttered the word, “Africa”, the students would reply “Tikka Tikka” resembling the sound of a drum or tribal instruments. The young children could not understand when I described my city of Cape Town has having everything other than bushveld, grass and animals in it. Whilst I am quite musical, I’m not particularly good at beating a drum. A 7 year-old Russian student declared me to be a ‘black magic’ person. Whilst I have dark skin, culturally there is no magic I subcribe to or any sangomas who shakes bones to solve my problems. Whilst we all belong to some tribe or other, I have never (sadly) resided in a hut, killed an animal for dinner or worn a loin cloth or animal skin. Whilst this might of been or still is a reality for many Africans, this is but one of multiple cultures that make up our continent. 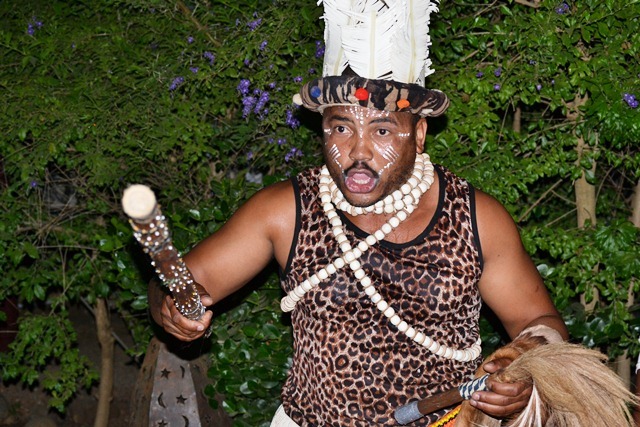 A man performing in traditional Zulu attire at Moyo Restaurant just outside of Cape Town. There’s a roving joke that many people believe we still have wild lions, giraffe, zebra and elephants wondering around in our back gardens. Crazily enough, I have been asked this on numerous occasions. As cool as this would be ironically, most South Africans have never and won’t see the Big Five in their natural habitats. Safari park prices are geared towards tourists and the average local cannot come close to affording the entrance fee to the park let alone a game drive. It makes me wonder what children are taught about Africa in schools today. I’m guessing black, wild, savage, tribesman and hunters about covers it. 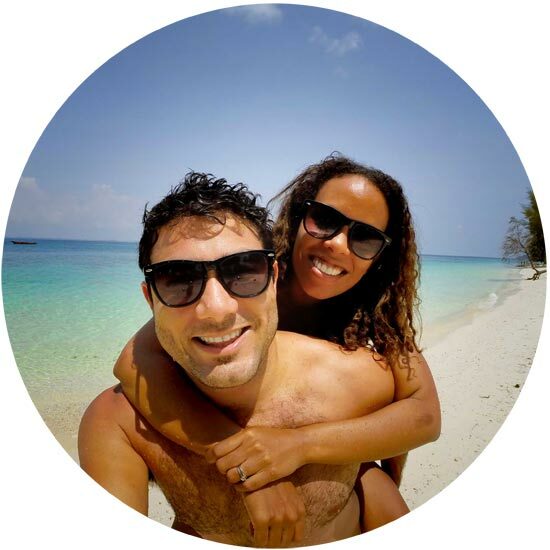 Now that we live in Thailand, when my husband mentions that he’s from Africa, locals cannot reconcile his white skin with Africa. Somewhere in school textbooks, it was omitted that South Africa has white, Indian, Black and coloured people residing within its borders. Evidently our 11 official languages have also perplexed some folk as the Ministry of Thai Education no longer classify South Africa as an English speaking nation and yet here I am, a native English speaker. To get a glimpse of our diversity, you needn’t look further than my bridal party of friends and family. Whilst I am extremely proud to hail from a continent boasting serene bushveld landscapes, majestic wild animals and a strong culture of dancing, music and drum beats, we have a lot more than that. South Africa itself is a rapidly developing nation boasting some of the most talented creatives in the sphere of music, DJing, art, dancing, cuisine, design, technology and fashion. 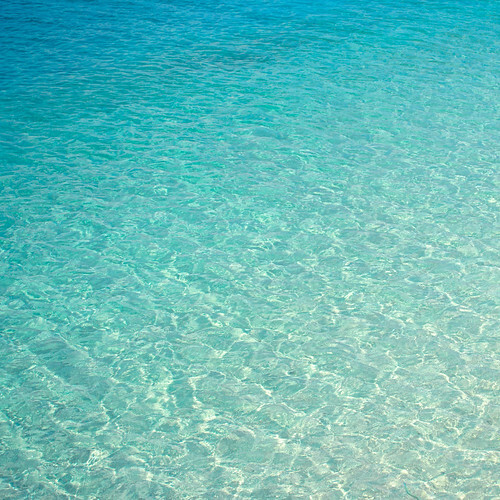 We have some of the cleanest water in the world and are one of the few countries where you can drink delicious water from the tap. In the centre of Cape Town we have European-style plazas with side-walk cafes serving superb espresso and buildings displaying remnants of Victorian and Cape Dutch architecture. We set trends, know good coffee, grow A-grade fruit, and produce the best meat and entrepreneurial minds. In 45 minutes you can drive from Cape Malay quarters on the slopes of Signal Hill with its curries, mosques and colourful houses to the townships where the music plays in spaza shops and young black boys kick a soccer balls beside houses made of tin. Young boys playing soccer in Beaufort West, South Africa. A BBoy crew break dancing at a fashion show in Cape Town’s city centre. I’ve been asked by dozens of travellers whether I know certain individuals from Kenya or Egypt. This is led me to believe certain things about South Africa a) They do not know that it is a country and not a continent b) it’s location (which is funny since ‘South’ should give it away). And seen as I don’t even know all my neighbours in my area, I wouldn’t have met you friend many borders away. One thing that always brings a smile to my face is when I say “South Africa” and the response is “Mandela”. What a wonderful association to have with our nation. I always beem with pride at having one of the world’s greatest icons call this country home. Whilst we are still a continent plagued by poverty, corruption and civil war, we are a land whose greatest treasure is the warmth, perseverance and spirit of community entrenched in our people. Some of my South African friends. A group of school boys feeding the birds at Kalk Bay Harbour. If we realise that most Chinese people no longer walk around in robes, black headwear and slippers whilst pushing carts and English citizens don’t move about in carriages dressed in big hats, corseted gowns and tailcoats, then surely we can assume that all inhabitants from the massive continent of Africa have evolved with the times too? The beautiful and diverse city of Cape Town. Were you ever surprised by how different a country/continent and its people really are? 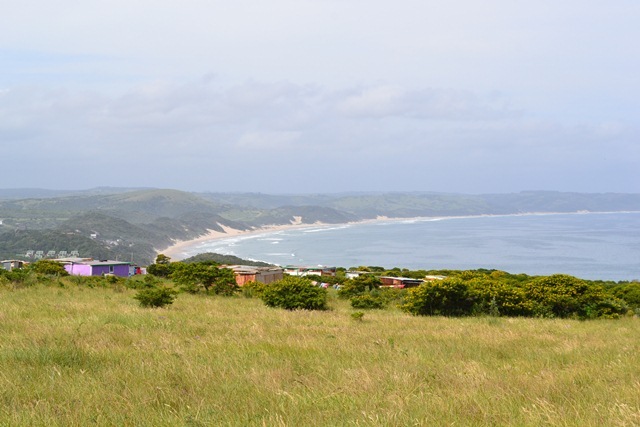 View of the ocean and colourful houses in an informal settlement along South Africa’s rural Wild Coast. South Africa’s French Quarter called Franschhoek. One of the many spectacular beaches in Cape Town, Muizenberg. Shopping at Green point’s African market in the centre of Cape Town.